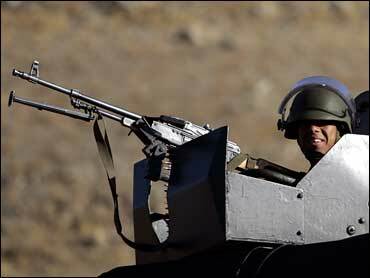 Turkish warplanes and helicopter gunships bombed Kurdish rebel positions along the border with Iraqi Wednesday, according to Turkey's official news agency, hours after a government offical said troops had fired shells across the border. Several F-16 warplanes loaded with bombs took off from an air base in southeastern city of Diyarbakir, private Dogan news agency and local reporters said. There were no reports of a large-scale land invasion into Iraq. Turkish artillery units have been shelling rebel positions as recently as Tuesday night in northern Iraq after a rebel ambush Sunday that killed 12 soldiers near the border, a government official said. He did not say which areas were targeted and refused to give further information. He spoke on condition of anonymity because he was not authorized to speak to the media. Turkey delivered a tough message to Iraq and Western allies Tuesday: A cross-border attack on Kurd guerrilla bases is coming unless the U.S.-backed government in the Iraqi north cracks down soon. "We cannot wait forever," Turkish Prime Minister Recep Tayyip Erdogan warned during a visit to London, saying his government had no choice but to consider "the military dimension." As Erdogan's government launched the diplomatic offensive in hopes of avoiding a conflict that could damage its ties with the West as well as Arab states, the looming possibility of a Turkish military drive into one of Iraq's few peaceful regions appeared to be having an impact. Washington issued its most direct demand yet for anti-rebel measures from Iraqi Kurds who hold effective autonomy over territory where the Turkish Kurd rebels have camps, and Iraq's prime minister ordered the closure of all of the guerrilla movement's offices in Iraq. Turks have grown skeptical of repeated pledges from the U.S. and Iraq to tackle the rebel Kurdistan Workers' Party, the PKK, so Erdogan went to London and his Cabinet ministers spread across the Middle East seeking to turn up the heat on the Americans and Iraqis to act. Iraq's interior minister attended a meeting in Kuwait of his counterparts from the region Tuesday - a gathering which yielded a joint statement condemning an attack two days earlier on Turkish troops by Kurdish rebels. The interior ministers of Iraq, Kuwait, Saudi Arabia, Jordan, Syria, Turkey, Egypt and Iran met to discuss how help stabilize Iraq but ended up also addressing the rising tension on the Turkish and Iraqi borders. The ministers condemned "all terrorist attacks against the Iraqi people, the Iraqi police... and against the neighboring countries and also condemn the terrorist attack against Turkish troops on October 21," said the meetings final statement, referring to the deaths of 12 soldiers and disappearance of another eight. Kurdish Iraq is, at the moment, unique. People can go to work without expecting to be blown up on the way. Children can walk to school without fear of being kidnapped. The Kurdish government is even making deals with foreign companies to develop its oil reserves. Sending their well-armed Peshmerga soldiers to battle either group could lead the region into the same kind of violence that has crippled the rest of Iraq. Nearly simultaneous bombs struck commuters in a predominantly Shiite area on the southeastern edge of Baghdad on Wednesday, killing at least eight people and wounding two dozens, police and hospital officials said. The two blasts, which occurred about 30 yards apart in Jisr Diyala, were targeting government employees, construction workers and vendors preparing to travel into the capital, according to the officials. Women and children were among the eight killed and 24 wounded. October is on course to record the second consecutive decline in Iraqi civilian deaths. The current pace of civilian deaths would put October at less than 900. The figure last month was 1,023 and for August, 1,956, according to figures compiled by The Associated Press. The AP tally is compiled from hospital, police and military officials, as well as accounts from reporters and photographers. Insurgent deaths are not included. Other counts differ and some have given higher civilian death tolls. Sunnis denounced a U.S. helicopter raid on Tuesday in which the military said 11 Iraqis, including five women and one child, were killed in a volatile Sunni area north of Baghdad. Neighbors and relatives of those killed Tuesday said 14 civilians were killed. Maj. Peggy Kageleiry, a U.S. military spokeswoman, said an Apache helicopter opened fire on a group of men observed planting roadside bombs. "The enemy forces ran into a house and took over the structure," she said, adding the attack aircraft continued to fire at the suspected militants as they tried to escape. Secretary of State Condoleezza Rice on Tuesday ordered new measures to improve government oversight of private guards who protect U.S. diplomats in Iraq, including extensive cultural awareness training for contractors. The steps, recommended by a review panel she created after last month's deadly Baghdad shooting involving Blackwater USA, also include ways to bring the State Department's rules of engagement into line with those of the military and the organization of "go teams" to investigate incidents in which weapons are discharged. Meanwhile, the private security firm Blackwater says the deaths of four of its guards in Fallujah, Iraq, three and a-half years ago could not have been avoided. In a report prepared for the U-S Congress, Blackwater says heavier guns and sturdier trucks would not have saved the team that was brutally killed after being lured by corrupt Iraqi forces into a well-planned ambush. This conclusion sharply contradicts the findings of a congressional investigation led by House Democrats and a wrongful death lawsuit filed by the families of the four slain guards. Blackwater is cast in both as an incompetent, penny-pinching outfit that sent an undermanned and poorly equipped detail through Fallujah, a known insurgent stronghold.